Chauncey Ryder was born in Danbury, Connecticut and grew up in New Haven. He moved to Chicago in his early 20’s, where he attended the Chicago Art Institute and Smith’s Art Academy. Ryder moved to Paris in 1903 and enrolled in the Academie Julien, where he studied with Jean-Paul Laurens and Raphael Collin. He began submitting work to the Paris Salon in 1903. Ryder returned to the U.S. in 1907, having begun a partnership with NYC art dealer William Macbeth, who would successfully promote Ryder’s work throughout the remainder of the artist’s life. In 1909, he opened a studio in New York City, but the following year purchased a summer home in Wilton, New Hampshire, where the terrain would provide a source for many of his best known pieces. In these years, he also maintained an association with the Lyme art colony, where, in the first decade of the twentieth century, a classic confrontation took place between advocates of the Tonalist and Impressionist styles. Interestingly, Ryder seems to have been a practitioner of both styles, though his work is usually characterized by a spare lyricism. Chauncey Ryder was elected an Associate of the National Academy in 1915 and a full Academician in 1920. 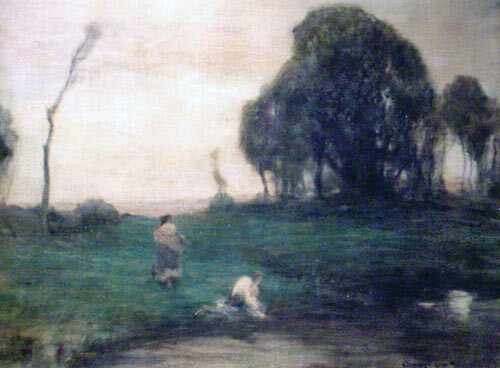 His work can be found in many museums, including the Pennsylvania Academy of Fine Arts, the Museum of Modern Art, the Wadsworth Athenaeum, the Smithsonian American Art Museum, the Baltimore Museum of Art, the Metropolitan Museum of Art, the National Academy of Design, the Corcoran Gallery of Art, and the Whistler House Museum.